From today one more Mobile Operator will fight for share of GSM subscribers of Gujarat. Gujarat already has 8 GSM Mobile Operators and the newest addition to this list is Aircel. 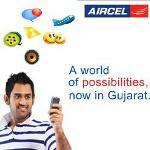 Gujarat is the 22nd Telecom Circle where now Aircel is present. There are Ads of Aircel in today’s edition of leading newspapers of Gujarat, however we were unsure about it launch in entire Gujarat of only few selected city so we contacted Aircel’s Corporate Communications Head – Ms. Shalini Sethi, she informed us that “Aircel is present in all of Gujarat”. We expect that competition in GSM space in Gujarat will get fierce with Aircel’s launch in the state as Aircel is more established Telecom operator than the other operators which recently launched their services in Gujarat. Aircel’s Prepaid SIM Card is available at Rs. 25. It comes with no talk time and lifetime validity. Prepaid subscribers have an option to choose from 3 FRCs priced at Rs. 77, Rs 123 and Rs. 222. For its Pospaid customers in Gujarat Aircel has introduced 4 Plans – Easy Minutes 499, Easy Minutes 799, Easy Minutes 999 and Easy Minutes 1999. Mr. Gurdeep Singh, Chief Operating Officer, Aircel said, “We are proud to be here in Gujarat and present to our customers a National Brand with a strong local connect. We will be introducing products and services uniquely tailored to meet the special needs of our Gujarat consumers and open to them a world of possibilities. We have introduced, extremely innovative Pocket Internet cards an Industry first by Aircel to democratize Internet on the mobile which offer the consumers unlimited browsing for a period of 30days @Rs 98; 3days @Rs 14 and a one day pack @ Rs 5 respectively anytime anywhere. Aircel, has introduced a Value plan with inbuilt VAS & Data @ Rs. 123 which gives you unlimited Pocket Internet surfing for a month and Unlimited dialer tunes with downloads at no extra cost. This is inclusive of free Stock Updates. Simple value plan offers STD @ 1p/1sec , Aircel to others @ 1p/ 2secs and Aircel to Aircel @ 1p/3secs. The validity is for a period of 90 days. Aircel subscribers in Gujarat can carry home tariffs while roaming on Aircel network across India for a period of 90 days. To address a significant population that has a strong base in US and Canada, Aircel provides an attractive ISD pack @1.6p/sec for 90 days inbuilt in the Simple Value Plan. Aircel introduces a Business Pack in Gujarat for the SME’s with unlimited community calling and Data @Rs.199 /Rs 499/Rs 999 for 1month / 3 months/ 6 months respectively offering absolutely free local Aircel to Aircel calls & SMS and Aircel to others and STD @ 45p. This is inclusive of free Stock Updates. Aircel announced the first PocketApps Store in association with Infosys this year. Aircel brings to its consumers in Gujarat thousands of applications with Aircel PocketApps, giving way to a million possibilities. For a weekly charge of Rs. 7, you can download as many free applications as you want which could be from tracking your expenses, monitoring your fitness, scanning restaurant menus to reading newspapers in regional languages or even getting road directions. VAS services of Aircel includes localized content including a WAP Portal page in Gujarati for any GPRS handset. In addition to this, there will be Music on demand, CRBT and an innovative voice based Doctor-on-call service among others. Apart from a Retail coverage Aircel will provide a range of both prepaid and postpaid products through its exclusive company outlets in Ahmedabad, Vadodara, Rajkot & Surat.